Every November, the European Microfinance Week (EMW) brings together a high-level group of decision-makers, opinion-leaders and practitioners from the microfinance industry to discuss the state of the sector and the way ahead in the coming years. This past November, the e-MFP team went one step further, and conducted a poll of attendees on the key trends affecting the sector and its level of preparedness to address them. Modeled on the survey conducted by the SEEP Network (Keeping an Edge: What Will It Take in the Current Microfinance Context), which polled leaders of 39 Microfinance Associations (MFAs) around the world, the e-MFP survey was sent to EMW delegates before and during the Week. The preliminary results were presented at the final plenary of the conference, along with the SEEP survey, thus allowing attendees to compare and contrast the results between the two perspectives, and build upon three days of discussion on the challenges and opportunities ahead. Relevance: Will this trend challenge MFIs’ ability to remain relevant, given their current business model and capacity level? Preparedness: How prepared are MFIs to adapt to this trend? Respondents had to rate each of the trends 1-5 in terms of relevance (not likely to very likely) and preparedness (poorly prepared to very prepared). The prime focus was looking at gaps – the differences between the challenge each trend posed to MFI ability to remain relevant on the one hand, and MFIs’ preparedness to deal with it on the other. In other words, the larger the perceived ‘gap’, the greater the challenge will be to the industry, according to the respondents. The results paint a picture of what a broad cross-section of the microfinance industry sees as the emerging trends, or to paraphrase Harvard Professor Michael Chu in the Conference’s opening session, how the industry avoids ‘being Kodak’. “We’re at the next wave of disruption” he claimed, “Microfinance was the disruption of finance; and now it will be disrupted itself”. The ‘gaps’ presented in the EMW survey perhaps foreshadow from where this disruption will come. The survey achieved a remarkable response rate well over 50%. As shown in figure 1, overall, respondents saw the largest gaps in diverse client needs, technology and decreasing market share. The latter also shows a clear difference from the original SEEP survey, which found no significant relevance-preparedness gap for ‘decreasing market share’. While the survey showed some variation among different types of e-MFP delegates, those who identified themselves as representing MFIs or other direct service providers reported the narrowest gap across all categories, both less concerned about the relevance of different trends and also more optimistic about MFIs' ability to meet them. Clients have increased demand for a wider range of financial services, many of which are not currently provided by the majority of existing MFIs. Broken down by trend, ‘Clients’ increasingly diverse needs’ revealed a 19% gap between the relevance of the trend and MFIs' preparedness to address it. But breaking the responses down by individual score reveals yet more: only 14% rated MFIs’ preparedness as high or very high, while 60% respondents rated the trend as relevant or highly relevant (see Figure 3). Broken down by respondent type, the challenge for MFIs to remain relevant to meeting client needs is relatively consistent among respondent segments. Their level of preparedness was more varied, with 57% of NGO delegates rating MFIs as slightly or poorly prepared, compared to 40% overall. Meanwhile, MFIs and other direct service providers saw the trend posing less threat to MFIs' future relevance (48%), and also least concerned about their ability to meet the challenge (28%) including the only respondents who rated MFI preparedness for this challenge as very high. New technology is affecting how products are delivered and banking is done. These include mobile payments, biometric identification devices, new IT platforms etc. With respect to ‘Emergence of new technologies’, 51% of respondents rated it likely or very likely to challenge MFIs relevance, and 22% said MFIs were prepared or very prepared to deal with it – a 29% gap. Broken down by respondent type, Fund Managers/Investors saw the trend as likely to challenge MFIs' relevance (75%), while rating MFIs’ preparedness among the lowest (44% – see Figure 6). 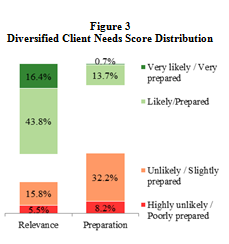 Meanwhile, for MFIs, the relevance-preparedness gap was essentially non-existent (3%). Overall, the challenge of ‘Evolving profile of microfinance funding’ produced a 28% gap between relevance and preparedness: 48% saw this trend as likely or very likely to challenge MFIs relevance, while only,20% thought MFIs are prepared or very prepared to deal with it (Figure 7). Interestingly, both investors and MFIs were most concerned about shifts in funding as likely or very likely to challenge MFIs’ relevance (56%). However, investors were notably more concerned, with none rating MFIs as being highly prepared, compared to 11% of MFI respondents. ‘Changes in financial regulation’ produced the smallest relevance-preparadness gap in both surveys. Nevertheless, only 2.1% in the EMW survey said MFIs were well prepared while close to half rated the trend as likely or very likely to challenge MFIs' relevance. NGOs saw regulation as the most significant trend to challenge MFIs’ relevance (see Figure 9) and were the most pessimistic about MFIs’ preparedness to deal with it. Moreover, a surprising 38% of Fund Managers/Investors rated this 5 out of 5 in terms of relevance – the highest level of concern recorded by any group in any trend category. Meanwhile, not a single DFI, Fund Manager or Support Organization respondent rated MFIs as very prepared to deal with this. The trend of ‘Decreasing market share’, defined as the competitive threat from new providers and platforms, diverged the most from the SEEP survey results – the only trend really to do so. While Microfinance Country Associations responding to the SEEP survey found a negligible 2% gap between relevance and preparedness, for EMW respondents, the gap was highest among the five trends – close to 40%. Nearly 60% of respondents rated the trend as likely or very likely to challenge MFIs’ relevance, whereas only 20% said MFIs were prepared or very prepared to deal with it. 77% of DFI respondents saw this trend as likely or very likely to challenge MFIs' relevance, and over a quarter of NGOs rated its relevance as 5 out of 5. Meanwhile, over half of NGOs and Investors said that MFIs were slightly or poorly prepared to deal with this challenge. As with other trends, MFI representatives were the least concerned, with a greater number (45%) reporting the MFIs as being prepared to deal with the trend than those who saw the trend as significant in the first place (35%). In this respect, they most closely reflected the responses of Microfinance Country Associations pooled in the SEEP survey. Both the e-MFP and the SEEP survey seek to paint a picture of what two overlapping respondent groups (Microfinance Country Associations and EMW delegates, respectively) consider to be the key disruptive trends to microfinance, and to what extent MFIs are generally prepared to meet those trends head on. There is great value in asking these questions – especially before and during a conference that seeks to identify and prepare for these trends before they can adversely disrupt the industry. Clearly, the most challenging trends for MFIs – given the gaps between the perceived challenge to their relevance and their preparedness to address it – are the reduction of market share that comes from new market entrants (such as mobile network operators) and the diversification of client needs - away from inflexible microcredit, to a complex array of services appropriate for the particular needs of certain segments. Respondents were clear on what is coming, but less optimistic with respect to how prepared MFIs are to deal with them. Perhaps this is a pessimism that stems from lack of familiarity – relatively few respondents at EMW were practitioners themselves. Those that were, proved to be the most optimistic in terms of their own perceived preparedness. Perhaps there is reassurance to be drawn from this – they know what they're doing. Or perhaps this a real cause for concern – MFIs are complacent (even ignorant) about what needs to be done in order to adapt. After all, with the exception of changes to the funding landscape, MFIs tended to consider the trends less challenging than respondents as a whole. Perhaps the most interesting ‘gap’ the survey has revealed is not the ‘preparedness gap’ per se, but the gap between practitioners and everyone else. Thank you e-MFP for sharing the results of the survey - interesting to compare findings.